Rogaine, also known as minoxidil, is one of the better known methods for helping to prevent hair loss in men experiencing male pattern baldness. The majority of people will have heard of Rogaine at some point in their lifetime. But what about Lipogaine? Is it as effective as Rogaine and can it be used as an alternative, or are you better off sticking with minoxidil? If you didn’t know, Lipogaine is essentially a shampoo blend that works to support minoxidil. This makes it easy to apply to your hair. But, it may be less effective than using Rogaine because it doesn’t contain minoxidil. That’s right – it’s very hard to compare these two as one of the main ingredients, and reasons that Lipogaine works, is that it contains 5% minoxidil. There’s no denying or arguing that Rogaine is one of the most effective hair loss products currently on the market – the only real competitor in terms of size is finasteride. 3 Do minoxidil shampoos like Lipogaine even work? 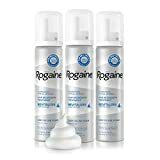 Rogaine has been the go to hair loss product for over 20 years now – so much so, that many people use the term Rogaine as a general name for the actual chemical, Minoxidil. The reason that Rogaine works so well is that in helps to increase the circulation of blood flowing through the scalp (this is also one of the reasons it’s primary side effects is headaches!). This extra circulation helps blood to flow to your hair follicles, which in turn spurs growth. The other side effects that you may experience from using Rogaine include weight gain and an itchy scalp. Though in spite of these possible side effects, Rogaine still proves to be one of the most popular methods of promoting hair growth and dealing with male pattern baldness today. But what about Lipogaine? Lipogaine was created to help deal with the hassle of applying Rogaine twice daily. This is one of the more common complaints about minoxidil – you have to continuously apply it until you’re ready to accept balding (which is totally normal, for the record). Keratin – Keratin treatments are extremely popular for hair loss, so including some keratin is a no brainer. This is especially true seeing as your hair is made up of a large portion of keratin. Argan Oil – Argan oil is pretty commonly used to help treat scalp conditions, which is one of the main reasons you’ll find it in the majority of hair loss shampoos. Often, temporary hair loss can be caused by an underlying condition. Jojoba Oil – Although the research on the effectiveness of jojoba oil is minimal, it’s still thought to be a good benefits to add to hair loss formulas. This is because it’s great for dealing with a dry scalp and helps to reduce the chance of getting dandruff. Biotin – Having a biotin deficiency is proven to have an effect on the quality of your hair. Making sure you get enough biotin in your diet is essential, and if you aren’t eating enough biotin naturally, then a supplement can make sense. Do minoxidil shampoos like Lipogaine even work? It’s debatable as to whether minoxidil shampoos even work to their full potential when they are diluted significantly. There’s little research to back up how effective that minoxidil shampoos can really be. The main reason that there is an issue with minoxidil shampoos is that to really work, minoxidil needs to be applied to your head for an extended period of time. If you’re using your shampoo in the shower, then there’s a good chance that you’re going to wash some of the formula off of your scalp before it really gets the chance to have an effect on your head. For the main reason that minoxidil shampoos are likely to be less effective than the real thing, I’d be inclined to opt for Rogaine as opposed to Lipogaine. Although there are many people who say that Lipogaine worked well for them, there are far more positive reviews of people who have used Rogaine successfully. There’s a reason it’s one of the big three hair loss products along with Fin and Nizoral – it just works! If you’re looking for a good way to mitigate any further hair loss and actually have a standing chance at fighting baldness, then I’d advise to opt for Rogaine out of these two options.